ANZ analysts are expecting to see a stable unemployment rate of New Zealand at 4.3% in Q1. On-going Brexit deadlock and likely future troubles for the UK PM May joins dip beneath 200-day SMA to please the Bears. The absence of economic data/events pushes traders more towards qualitative factors. The GBP/USD pair is taking the rounds near 1.2940 while heading into the London open on Wednesday. The Cable slipped to the lowest in nine-week on Tuesday as the return of the UK lawmakers from Easter recess flooded global markets with Brexit pessimism. In addition to doubts over the future position of British PM Theresa May, less development at the cross-party talks to overcome Brexit deadlock also weigh on the British Pound (GBP). On the other hand, welcome data points, the surge in equities and investor trust over the greenback during uncertain times fuelled the US Dollar (USD) versus the majority of its counterparts. The Cable witnessed some profit-booking moves during the early Asian session on Wednesday amid Reuters report of increased hiring from the UK in short-term. Though, the same can’t be termed as signaling the pair’s recovery as doubts over smooth British departure and break of the 200-day simple moving average (SMA) favor the sellers. Also to note, there are no major economic data/events scheduled for release during the rest of the day, which in-turn highlights qualitative catalysts for fresh impulse. Among them, the US equity moves, politics and Brexit are some headline words to observe. Given the pair’s sustained trading beneath 1.2970/60 support-zone comprising 200-day and 100-day SMA, chances of its additional south-run to 1.2900, 1.2880 and 1.2830 can’t be denied. However, a successful break of 1.2970 can reprint 1.3000 and 1.3030 on the chart with six-week long descending trend-line at 1.3050 being follow-on resistance to follow. Analysts at TD Securities note that the Australia’s March quarter core CPI rose by a feeble +0.2%/q and 1.4%/y, well short of even the most pessimistic forecast. According to analysts at ANZ, the downward surprise in Australia’s core inflation in Q1 leaves the RBA will little choice but to cut the cash rate by 25bp at its May meeting, with another 25bp likely to follow in August. EUR/USD is looking south, having printed three-week lows yesterday on the back of broad-based dollar demand. Technical studies are biased bearish. Traders may continue to buy US dollars today on growing US-EU economic divergence. The pivotal support at 1.1176 may come into play if the German IFO data, due at 08:00 GMT, disappoints markets. EUR/USD is on the defensive ahead of the German data release, having dropped 0.27 percent on Tuesday. The shared currency fell to 1.1192 yesterday, the lowest level since April 2, as traders snapped up US dollars, possibly in response to the macro data released last week, which triggered hopes the world’s biggest economy may have fared better-than-expected in the first quarter. The drop to levels below 1.12, however, was short-lived, seemingly due to the narrowing of yield spreads. The difference between the yields on the 10-year US and German government bond yields fell more than five basis points to 253 basis points in the EUR-positive manner. As a result, the spot closed yesterday at 1.1226. 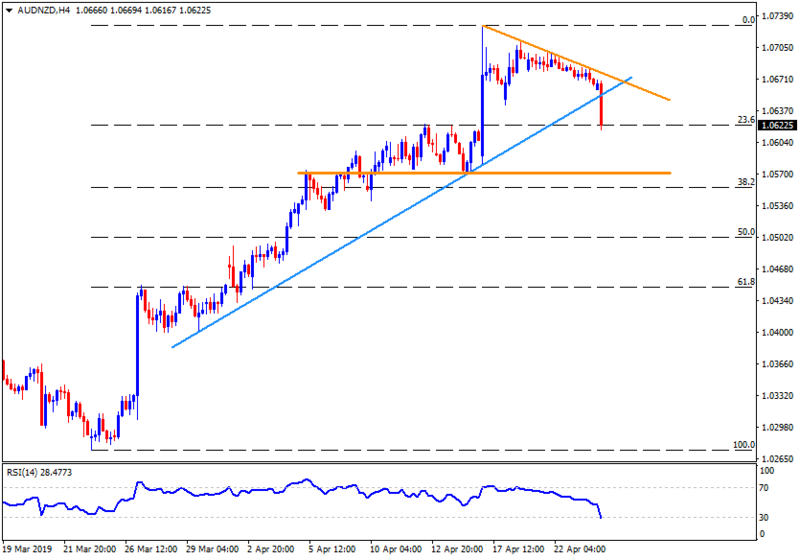 Despite the pair’s recovery from sub-1.12 levels, technicals remain bearish with the 4-hour chart reporting a bear flag pattern. The 5-, 10- and 20-day moving averages (MAs) are trending south a week after the pair created a bearish lower high along the 50-day MA. The spot, therefore, appears on track to test the pivotal support at 1.1176 (March low). Further, traders may continue to buy US dollars, courtesy of growing economic divergence between the US and the Eurozone. Also, the common currency may remain on the defensive as polls show Spaniards are undecided less than a week ahead of the general elections (scheduled for Sunday). The EUR-bearish case may strengthen further if the forward-looking German IFO business climate, expectations and current assessment indices for April miss estimates by a wide margin. The data is due for release at 08:00 GMT. It is worth noting that business confidence has improved more than expected last month, snapping six straight monthly declines. The business climate in the manufacturing sector, however, had weakened. That said, the probability of April IFO surveys beating estimates today is high, given the recent signs of recovery in China – one of Germany's biggest trading partners. A big beat may put a bid under the EUR. Following the release of dismal Australian CPI readings for the first quarter, the Citibank analysts now see a rate cut by the Reserve Bank of Australia (RBA) next month. “Expect a Reserve Bank of Australia rate cut in May, the second cut could well follow the next month, in June. The bank had previously been calling for the rate on hold. Gold dropped to the year?s low recently after the return of global traders were welcomed by upbeat US data and rising equities contrast to weak Aussie data. Greenback strength erodes the bullion’s safe-haven demand. The US Dollar (USD) is likely cheering upbeat data and rising equities at home that contrasts to sluggish outcome abroad. Gold is on the rounds near $1269 ahead of European open on Wednesday. The yellow metal dropped to the year’s low on Tuesday after global traders were welcomed by upbeat US data and rising equities when they returned from Easter break. The US new home sales grew more than 0.650 million forecasts to 0.692 million with the change in percentage terms beating -2.5% market consensus with +4.5% rise. Global equity markets were also on the rise after positive results from Twitter and Coca Cola buoyed trade sentiment. The S&P 500 posted record close whereas DJIA and Nasdaq also grew more than 0.5%. The greenback favor was carried forward during early Wednesday when quarterly Aussie CPI data disappointed global markets with 0.0% QoQ readout versus 0.2% forecast and 0.5% prior. The US 10-year government bond yields generally have a negative correlation to gold prices and are presently unchanged around 2.56%. Looking forward, risk events like Brexit, the US-China trade deal and geopolitical plays surrounding North Korea, Syria and Libya are likely to entertain the metal traders. Considering 12-day old descending trend-line, the bullion may extend its downside but an eight-month-long upward sloping support-line at $1263 might challenge bears, which if broken could recall $1260 and $1257 ahead of highlighting 200-day simple moving average (SMA) near $1250. Meanwhile, $1273 trend-line resistance, $1278 and $1281 may limit the quote’s nearby upside, a break of which can shift buyers’ attention to 100-day SMA level of $1291. According to the latest survey conducted by the Recruitment and Employment Confederation (REC), the UK labor market showed a surprising strength even though the British employers are concerns about the looming economic prospects amid Brexit uncertainty. One-month 25 delta risk reversals on AUD/USD(AUD1MRR), a gauge of puts to calls on the Australian currency, fell from -0.65 to -0.725 post the Aussie CPI release, signaling a rise in demand (implied volatility premium) for the Aussie dollar put options (bearish bets). The inflation, as represented by the consumer price index, rose 0.3 percent quarter-on-quarter in the first quarter, missing the estimated rise of 0.4 percent, the official data released at 01:30 GMT today showed. The first quarter annualized core CPI or RBA's trimmed mean also missed estimates by printing at 1.6 percent, after having risen 1.8 percent in the preceding quarter. The increased demand for the Aussie puts indicates the investors are hedging for a deeper drop in the Australian currency. The AUD/USD hit six-week lows near 0.7030 a few minutes before press time. NZD/USD flashes fresh low of the month by being near 0.6620 after Australia’s sluggish inflation data also negatively affected the New Zealand Dollar (NZD) because of their trade ties. The pair has already dipped beneath 61.8% Fibonacci retracement of its October to December 2018 upside, signaling brighter chances of further declines towards late-October highs near 0.6610 followed by January month low around 0.6585. If at all the quote continues trading southward under 0.6585, 0.6570, 0.6510 and 0.6470 may offer intermediate halts during the further downpour to 0.6420. Alternatively, an upside clearance above 61.8% Fibonacci retracement level of 0.6630 can recall 0.6670 and 50% Fibonacci retracement near 0.6700. However, 0.6700-0.6710 area and 0.6730 resistance-confluence comprising 200-day SMA and a month old descending trend-line could challenge buyers then after. USD/CAD jumped to 1.3456 soon before press time, the highest level since March 8, possibly on the back of broad-based US dollar strengthen and expectations that the Bank of Canada will adopt a neutral stance on interest rates later today and trim 2019 growth forecasts. Notably, the currency pair is currently trading above the upper edge of the contracting triangle, as seen on the daily chart. A breakout would be confirmed if the pair remains above that key hurdle post the Bank of Canada’s rate decision, due today at 14:00 GMT. That would open the doors to a retest of January highs above 1.3660. The outlook would turn bearish if and when the spot finds acceptance below the lower edge of the triangle. AUD/USD has slipped to six-week lows near 0.7030 in response to the weaker-than-expected Aussie CPI release. The AU-US 10-year bond yield spread has hit a fresh multi-decade low in the AUD-negative manner. AUD/USD fell to 0.7031 soon before press time, the lowest level since March 11, extending the 40-pip drop seen immediately after the Aussie CPI release at 01:30 GMT. The cost of living in Australia, as represented by the consumer price index, cooled to 0.3 percent in the first three months (Q1) of 2019, following a 0.4 percent rise in the final three months of 2018. The markets were expecting a quarter-on-quarter rise of 0.4 percent in the first quarter. The RBA's mean or core inflation also cooled to 1.6 percent in Q1, having risen by 1.8 percent year-on-year in the fourth quarter of the last year. With the below-forecast inflation figure, the spread between the Aussie and US 10-year government bond yields have dropped to -0.76 basis points - the lowest level since October 1981. 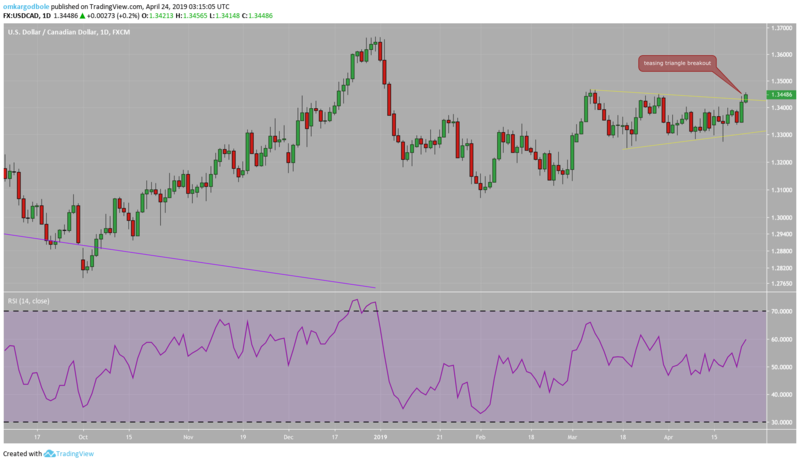 As a result, the sell-off in the Aussie dollar looks to have legs, meaning the psychological support of 0.70 could come into play in the next 24 hours. Brent oil is currently trading at $74.05 per barrel, having hit a high of $74.70 yesterday. That was the highest level since Nov. 1. The rally seems to have stalled with signs of indecision on the daily chart – Brent created a doji candle yesterday. Further, on the hourly chart, the black gold seems to be creating a double top pattern with the neckline support at $73.96. Acceptance below that neckline support would confirm a double top breakdown and create room for a deeper pullback to $73.22 (target as per the measured move method). A daily close below $74.00 would validate yesterday’s doji candle and neutralize the immediate bullish outlook. Analysts at National Australia Bank (NAB) offer a sneak peek at what to expect from the Bank of Canada (BOC) April monetary policy decision due to be announced later today at 1400 GMT. “Rates very likely on hold. Focus therefore will turn to the outlook with weakness in the household sector under close watch. Aussie 10-year bond yield fell eight basis points to three-week lows after the dismal Aussie inflation figure. Australia's consumer price index cooled to 0.3 percent in the first quarter of 2019. Australia's 10-year government bond yield slipped to three-week lows on Wednesday, as the quarterly Australian inflation figure missed estimates validating the dovish RBA expectations. The benchmark bond yield fell eight basis points to 1.799 percent, the lowest level since March 4 after the official data released at 01:30 GMT showed the consumer price inflation (CPI) rose 0.3 percent quarter-on-quarter in the first quarter, narrowly missing the estimated rise to 0.4 percent. Further, the RBA's trimmed mean CPI also came-in weaker-than-expected at an annualized 1.6 percent. The below-forecast CPI readings may bolster the bets of RBA cutting rates twice in the second half of this year. The central bank ditched its long-held tightening bias in February. Most investment banks have predicted two rate cuts for 2019 ever since. AUD/NZD slipped beneath an upward sloping trend-line stretched since late-March after Australia?s headline inflation numbers disappointed Aussie buyers. AUD/NZD trades around the lowest level in a week to 1.0630 during early Wednesday. The pair slipped beneath an upward sloping trend-line stretched since late-March after Australia’s headline inflation numbers, namely consumer prices index (CPI) and RBA trimmed mean CPI, lagged behind market consensus and prior readings. In addition to breaking near-term support-line, the quote is also testing the 23.6% Fibonacci retracement of its March to April upside, at 1.0620, which if broken could further weaken the pair in direction to 1.0570 horizontal-line. If prices keep trading southward under 1.0570, 1.0530 and 1.0500 are likely following numbers to appear on the chart. During the reversal/pullback, 1.0640 and 1.0670 can be considered as nearby resistances whereas a weeklong descending trend-line at 1.0680 may challenge buyers then after. Should there be increased buying pressure past-1.0680, 1.0700 and 1.0730 could become Bulls’ favorites. Australia's first quarter consumer price index missed estimates, sending the AUD lower across the board. AUD/JPY has dropped to 78.76 - 61.8% Fib R of 77.5/80.72. The key Fib hurdle could be breached as Australia's 10-year government bond has dropped sharply on the back of weak data. The Australian dollar is fast losing altitude in response to the weaker-than-expected Australian first quarter consumer price index released at 01:30 GMT. The AUD/JPY pair has shed more than 50 pips and is currently trading at 78.76, which is the 61.8 percent Fibonacci retracement of the rally from 77.54 to 80.72. Australia's inflation as represented by the consumer price index (CPI) rose 0.3 percent quarter-on-quarter in the first three months of 2019, missing the expected 0.4 percent rise. The inflation had risen by 0.4 percent in the final quarter of 2018. The Reserve Bank of Australia's (RBA) trimmed mean, which is widely considered a more reliable figure, rose 1.6 percent year-on-year, missing the estimate of 1.7 percent and down from the previous quarter's print of 1.8 percent. The below-forecast CPI readings will likely reinforce the dovish RBA expectations. The central bank is widely expected to cut rates in the second half of this year, having ditched its long-held tightening bias in February. 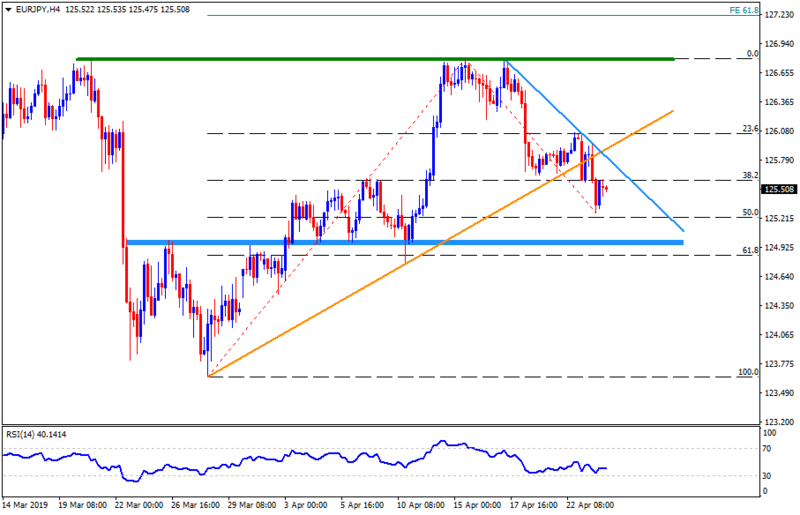 AUD/JPY, therefore, may find acceptance below the 61.8 percent Fib support of 78.76. Supporting that bearish case is the fact that Australia's 10-year government bond yield has nosedived by eight basis points to 1.80 percent following the release of the dismal CPI reading. Softer than expected and previous readouts of inflation data opens the gate for the RBA’s dovish comments. Risk events will be in the spotlight for now. AUD/USD drops to 0.7050 just after quarterly inflation data from Australia shook Aussie during early Wednesday. The pair previously declined on the greenback strength and marker risk-off due to the return of global investors from Easter holidays. The first quarter (Q1) 2019 inflation numbers for Australia signal weak picture of the commodity-linked economy. The headline consumer price index (CPI) grew 0.0% versus 0.2% forecast and 0.5% prior on a quarterly basis while registering a 1.3% YoY increase against 1.5% market consensus and .8% earlier. Further, RBA trimmed mean CPI (QoQ) flashed 0.3% against 0.4% forecast and prior but the yearly facts revealed 1.6% figure compared to 1.7% expected and 1.8% previous readout. As we have already witnessed the Aussie inflation data, market focus may shift towards the US catalysts as few signals from Australia are left to observe. The US economic calendar seems silent for the day and has no major details to observe. However, earnings season is on its run and may keep affecting the global risk sentiments. Off-late numbers from the US giants like Twitter and Coca Cola pleased equity buyers. Additionally, developments surrounding the US-China trade talks and any confirmations on likely break of China’s monetary stimulus could also direct near-term Aussie moves. Furthermore, AUD/USD is also considered as a risk barometer and hence moves surrounding the US 10-year treasury yield, another indicator of market sentiment, should also be followed closely. The US yield currently remains unchanged near 2.57% but dropped almost 2 basis points on Tuesday. 50-day simple moving average (SMA) level of 0.7115 and 100-day SMA level of 0.7135 are likely immediate resistances ahead of the 200-day SMA level near 0.7185/90. Alternatively, sustained break of 0.7100-0.7095 support-zone, comprising seven-week-old support-line can fetch prices to 0.7050, 0.7030 and March month lows near 0.7000. Following above-forecasts Australia's Q4 2019 CPI readings, today's inflation figures for the Q1 showed a bleak picture, with both the headline and core figures missing expectations. The core figures matched expectations, keeping the annualized inflation rates below the Reserve Bank of Australia’s (RBA) 2-3 percent target range. Q1 CPI headline q/q +0.0% vs. 0.2% exp and 0.5% prior. Q1 CPI headline y/y +1.3% vs. 1.5% exp and 1.9% prior. RBA trimmed mean q/q +0.3% vs. 0.4% exp and 0.4% last. RBA trimmed mean y/y +1.6% vs. 1.7% exp and 1.8% last. The White House published a statement last minutes, citing that the US Trade Representative (USTR) Lighthizer and Treasury Secretary Mnuchin are likely to travel to Beijing for trade talks starting April 30th. The Chinese delegation will visit the US for further negotiations starting May 8th. The People's Bank of China (PBOC) has injected ¥267 billion via one year targeted medium term lending facility (TMLF) with an aim to boost lending to small private firms. The positive effect of an increased supply of credit to small firms could be seen in the form an uptick in the Caixin China's manufacturing PMI's over the next few months. The guage surveys the small and medium-sized export oritented units as opposed to the government PMI, which mainly focuses on the state-owned enterprises with an easy access to credit. EUR/JPY dropped below four-week-old ascending trend-line on Tuesday and on the decline since then, indicating brighter chances of flashing 125.00 ? 124.95 area. EUR/JPY is trading near 125.50 during early Wednesday. The quote dropped below four-week-old ascending trend-line on Tuesday and on the decline since then, indicating brighter chances of flashing 125.00 – 124.95 area again on the chart. Should the quote drops beneath 124.95, there are multiple supports between 124.60 and 124.40 whereas 124.00 can please sellers then after. In a case where prices decline below 124.00, 123.80 and 123.60 could flash on the Bears’ radar ahead of aiming 123.00. On the upside, 125.60 and immediate descending trend-line at 125.85 can keep limiting the pair’s advances, a break of which may escalate the recovery to 126.30. However, 126.75/80 is a tough resistance-zone past-126.30 which if broken could propel the quote towards 61.8% Fibonacci expansion (FE) of its recent moves near 127.25. GBP/JPY is currently flatlined just above the 200-day moving average (MA) line of 144.58. The currency pair fell 0.39 percent yesterday and closed below the support at 144.78 (April 9 low), validating the 14-day relative strength index's (RSI) move to the bearish territory below 50 seen on April 18. The path of least resistance, therefore, is to the downside. The 200-day MA support of 144..58 could be breached during the day ahead, allowing a drop to the head-and-shoulders neckline support at 144.00. There is a high level of risk in Margined Transaction products, such as, Foreign Exchange (FX) and Metals trading which may not be suitable for all traders as it could result in the loss of the total deposit or incur a negative balance; only use risk capital. Prior to trading any products offered by ATC BROKERS, please carefully consider your experience level and financial situation.